On Sunday, February 19, 2017, already a third Sister from Poland, Sr. Mary of St. Joan (Paulina Augustyniak from Warsaw) completed the next step in her formation and made her perpetual vows in peace and gratitude to God. 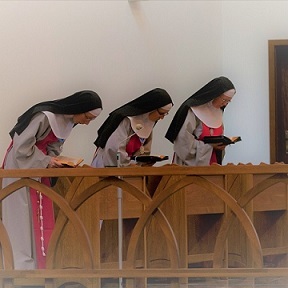 In her heart she sang a “double” Magnificat, because of her perpetual vows and the celebrations in honor of St. Joan de Valois, her patron saint. A few days before the great event, Sr. Mary of St. Joan’s twin brother, who is a priest, arrived from Poland. Unfortunately, due to health reasons, the Sister’s father could not personally attend in the ceremony, but his fatherly love stayed near her all the time as he was uniting in mind and spirit with his children, as they were uniting with their Dad despite the distance. Bishop Michel Santier presided over the Holy Mass and accepted the vows of Sr. Mary of St. Joan. The Mass was further embellished by the beautiful music played on the piano by Anna – an Oblate from the convent in Thiais – to the accompaniment of a flute and organ. In the evening, the newly perpetually professed Sister started her 10-day “nuptial” retreat in strict silence and recollection, in intimacy with the Bridegroom.